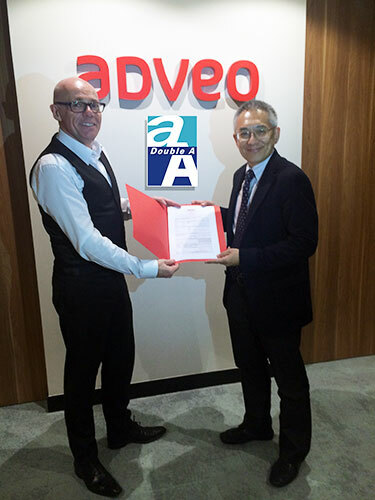 Alizay, France, 21 May 2015 – Double A partners with ADVEO, Europe’s largest wholesaler on office supplies. This commitment plans to roll out Double A through Europe, to increase the presence of Double A’s premium paper across the ADVEO network (Calipage, Plein Ciel, Elite group, Office Deal, Buro +…). Following this new agreement, Double A is able to expand its presence in Europe through an increased availability in ADVEO retail outlets. Double A is already available in France, Germany and Belgium. With this new partnership Double A will be able to reach other markets such as Spain and Italy. Europe is a priority market for Double A. For two years now, Double A has strengthened its presence on the continent by restarting the Alizay paper factory and also through its distributors. ADVEO is recognized as a leader of the European office supply market. ADVEO is therefore an ideal partner for Double A. “ADVEO is a strategic partner for Double A. We hope to be present in all of ADVEO’s European retail outlets by the end of the year”, states Thirawit Leetavorn, Senior Vice-President, Double A. The new agreement is part of ADVEO’s strategy to strengthen its product offer through partnerships with premium range paper brands. This new partnership will be a strategic benefit for partners such as Double A, for whom Europe is a key market. “The qualities of Double A paper correspond to the premium requirements of our business”, declares Philippe Guillotin, Europe Merchandising and Purchasing Director, ADVEO. “The selection of brands that we propose in means that we have a differentiated value offer and a real commercial advantage. Offer Double A paper in European countries allows us to strengthen our position as a market leader”.